NOT SO FAST Dan Bradford is ready to rebuild, but says red tape is slowing him down. It's a busy Thursday morning in Coffey Park as the debris cleanup is in full effect. Workers in white protective suits are clearing out home sites throughout the wasteland where some 1,300 homes were destroyed in the October Tubbs fire. The sound of beeping trucks backing up fills the air, as heavy front-loaders are making piles of trashed cars and all sorts of rugged equipment is rolling around the streets. Numerous sites have been cleared in the mass cleanup underway. They await new foundations and the first swing of a hammer into a two-by-four to signal that the rebuilding is afoot. Throughout Coffey Park, sites have gotten the federal Environmental Protection Agency seal-of-approval, signified by a laminated certification of safety on the front lawn. Coffey Park is coming back—except in front of the former home at 1613 Kerry Lane, where homeowner Dan Bradford has been waiting for city approval of a private cleanup and rebuilding plan submitted days after the fire by his Lake County–based contractor-friend Mark Mitchell. Bradford is one of more than 300 residents split between the city and county who have so far "opted out" of the cleanup that's being undertaken by contractors working under a federal-state umbrella that includes the Federal Emergency Management Agency and the state Office of Emergency Services, and overseen locally by city and county officials. But Bradford had good insurance and an experienced contractor ready to go just days after the fire, and didn't want to go through the time-consuming rigamarole of the opt-in plan. Bradford thought the opt-out would expedite his rebuilding process; instead, it slowed it down. Homeowners who lost their property to the fire, approximately 5,100 in the county, have until Nov. 22 to either opt-in or opt-out with the mass cleanup already well underway. Bradford didn't sign up and doesn't plan to. 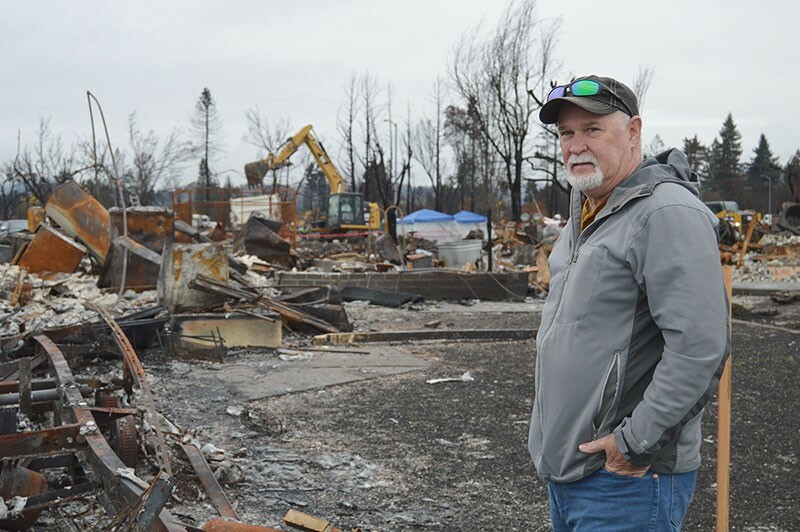 He just wants the city to approve his contractor's debris-removal plan and his rebuilding plan, and as of last Friday, he did get some good news from the city: they'd approved his debris removal plan. Now comes his rebuilding plan, which has not yet been approved. It remains to be seen what will happen if the remaining noncompliant residents blow past the Nov. 22 date and the hold-outs don't opt-in to the program. Sonoma County Supervisor James Gore says nobody will be forced into any abatement program on Nov. 23 or forced to sign up with the sanctioned cleanup plan if they don't want to, despite the Nov. 22 deadline. The hope is that the debris cleanup will be completed by the end of the year. But as of Nov. 22, more than homeowners out of the 5,100 burned out in the city and county still had not signed up at all. Hundreds had opted out, including Bradford, only to wait for city and county bureaucracies to catch up with their own debris-cleanup plans and set up a process for them. The city started reviewing and approving (or rejecting) opt-out plans on Nov. 13, according to emails from Santa Rosa City Manager Sean McGlynn. The debris removal was well underway by the time Bradford got his approval on Nov. 18. According to the numbers provided by the joint county-city information center, as of the morning of Nov. 22, 188 county property owners had opted out; 139 city property owners had gone that route, including Bradford. There were 229 parcels on city land, and 381 on county land, that did not have the necessary "right to enter" paperwork filed, or hadn't signed on to the debris removal plan. Nobody, says Gore, will be able to rebuild anything in Coffey Park until all the sites have that EPA sign in the front yard. That's to make sure contractors aren't laboring in toxic work sites. The EPA sign-off is a requirement for everyone, Bradford included, whether they opted in or opted out of the debris cleanup. Bradford, who is 60, was burned out of his home on the morning of Oct. 8 and escaped with his two dogs. He's a respiratory therapist at Santa Rosa Memorial Hospital who lost his wife, Vicki, two years ago. Bradford has been living in a Rincon Valley rental and has taken a two-month leave from work to sort out the details of his rebuilding. He considers himself among the lucky. "You really have to stay on top of the phone calls—you can't miss a call," Bradford says of the process. He returned to work for a couple of days after the fires but realized he couldn't put his patients first if he was always waiting for that critical call from the insurance company. Bradford is not the suing type and says with a smile that the fires were an act of God. He's not jumping on to any PG&E legal action around the fire and what might have caused it. He just wants to get back into his house, with his dogs, as quickly as possible—and wonders what the hang-up is and why the city gave citizens the chance to opt-out without having a process in place to deal with people like him who went that route. "It takes a toll," says Bradford of the emotional stress of being displaced and caught in the bureaucratic shuffle. "I've been trying to maintain some type of normalcy, but it's hard for people who are displaced. That's all the more reason to rebuild quickly." A newcomer to Coffey Park, Bradford says his heart goes out to longtime residents who were burned out. To add insult to the injury of losing his home, someone stole the undamaged metal mailbox from Bradford's front yard. He laughs and shrugs about it as Mitchell pulls up in his truck. Mitchell, who owns Lake County Contractors, has been through this before—he's still going through it in Lake County. He rebuilt 31 houses destroyed in the 2015 Lake County fires, including, he says, the first one that went up after the firestorm. He's eager to be the first guy swinging a hammer in Sonoma County, too, as he and Bradford take in all the surrounding activity and wonder why they can't be a part of the action. A who's who of big-dollar contractors from around the region—those Ghilotti Brothers trucks are hard to miss—are hard at work on the cleanup, while Bradford's left to contemplate his patch of black grass with his hands in his pockets.